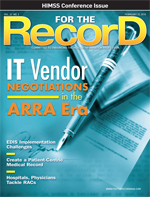 Hospitals and affiliated physicians can work together to defeat RAC audits. Although hospitals so far have felt the brunt of recovery audit contractor (RAC) recoupments, hospital-affiliated physicians (ie, those who aren’t employed by a hospital but have privileges to practice there) won’t likely be off the hook for much longer. In June 2009, the Centers for Medicare & Medicaid Services (CMS) announced on its Web site that it will not automatically deny claims associated with a full inpatient denial. However, experts say this will probably change in the not-too-distant future. In other words, it’s plausible that when a RAC denies an inpatient hospital claim, it could eventually deny other claim types associated with that inpatient stay. “It hasn’t happened yet, but it would be an easy data mine for an audit,” says Day Egusquiza, president of AR Systems, Inc in Twin Falls, Idaho. Others agree it’s only a matter of time before physicians will be held accountable for hospital-related denials. “The majority of doctors have really enjoyed a good ride for the last 15 years watching hospitals get punished,” says William V. Walker, MD, FACP, of Midwest Healthcare Coding, LLC in Chesterfield, Mo. “I don’t know whether it will be this year, next year, or the following year, but [RACs] are coming and doctors aren’t going to continue to skate.” Some physicians have already been subject to isolated reviews resulting in costly settlements, he adds. Physicians certainly weren’t immune to recoupments during the three-year RAC demonstration project. During this time, RACs identified $19.9 million in overpayments for physician services through March 27, 2008. Physicians were especially scrutinized for billing excessive/multiple units of services. Although RACs did not review evaluation and management services to determine the correct level of service, they were given the authority to look for other errors (eg, duplicate payments, violations of Medicare’s global surgery rules, definition of a new patient). However, despite this authority, RACs selected very few of these claim types during the demonstration, according to the June 2008 CMS RAC demonstration project evaluation report. Another challenge—though not as significant as inequitable accountability—is the fact that hospitals and physicians are paid under two entirely separate methodologies, says Egusquiza. Currently, the CMS generally pays the hospital a single prospectively determined amount under the inpatient prospective payment system for all the care it furnishes to the patient during an inpatient stay. The physicians who care for the patient during the stay are paid separately under the Medicare physician fee schedule for each service they perform. In May 2008, the CMS launched the Acute Care Episode demonstration, a hospital-based program that tests the use of a bundled payment for both hospital and physician services for a select set of inpatient episodes of care to improve the quality of care delivered through Medicare fee for service. Although the concept of a bundled payment may sound good in theory, it presents unique challenges for hospitals, including having to negotiate and split payments with physicians, says Egusquiza. For now, the fact remains that both hospitals and affiliated physicians will be subject to RAC reviews regardless of whether those reviews are part of a larger and more coordinated and integrated effort. Automated reviews are currently under way, and many RACs have begun posting information about complex diagnosis-related group (DRG) reviews as well. Complex medical necessity reviews are also expected to begin this year. This is an ideal time for hospitals to begin cultivating meaningful relationships with affiliated physicians and office staff members if they haven’t already done so, says Walker. “RACs pose an opportunity for hospitals to extend a hand or olive branch to the physicians,” he says, adding that many physicians simply don’t understand potential RAC implications. Greater communication can help resolve the ever-present problem of incongruent coding that occurs when hospital claims include diagnoses, procedures, or patient statuses that don’t match what’s listed on physicians’ claims. Explain to physicians that when their claims don’t match those of the hospital, it’s going to look suspicious to a RAC, says Egusquiza. If the hospital bills a higher level of patient status (eg, inpatient vs. observation) and the physician bills a lower level (or vice versa), “somebody is going to get audited,” she adds. Some hospitals find it helpful to send coding summaries to affiliated physician practices. This helps to ensure that everyone is on the same page and reporting consistent information, says Walker. But physician practice coders shouldn’t necessarily assume that hospital data are correct, says Lori Brocato of HealthPort. Coders in both physician practices and hospital settings should engage in ongoing dialogue to ensure the accuracy and consistency of the information being reported to payers, she adds. Some physicians may see RACs as an opportunity to hire certified coders or those who have significant professional experience and who can question coding accuracy when necessary, says Brocato. Seasoned coders can help ensure compliance and can challenge the physician and/or hospital when documentation is insufficient or when it appears that a physician may be billing erroneously, such as excessive units for a particular service, she adds. “Hospitals can be instrumental in providing the support. The vast majority of physician offices do not have trained or certified coders, but most hospitals do,” says Walker. He suggests inviting physician practice coders to ongoing hospital coder education sessions. Training sessions should focus on inpatient and outpatient coding guidelines so as to enhance the lines of communication between the two settings. Training could also include guidelines related to certain ICD-9-CM codes for particular specialties in which affiliated physicians concentrate. Although hospitals aren’t obligated to provide training to affiliated physicians or physician practice coders, there are certainly incentives to do so. Not only will hospital-sponsored training enhance collegiality and cooperation, but it will also reduce the frequency of incongruent information, says Walker. However, implementing a training program for hospital-affiliated physicians is no small task, particularly when an average-size hospital could have as many as 100 physicians to coordinate, says Egusquiza. So how does an organization begin to tackle such a mammoth project? First, determine who will provide the training. Brocato says the best person to educate a physician is another physician (eg, a physician advisor). The only caveat is that physician advisors may have limited availability. Nurses or case managers can also provide education and training because they have likely developed a professional rapport with physicians, she adds. Next, focus on certain high-risk areas. Patient status is a good example because it’s often inconsistently reported, says Egusquiza. During the demonstration project, RACs frequently targeted one-day stays in which patients were admitted as inpatients and subsequently discharged the next day when they should have been placed in observation instead. Ultimately, RACs determined that 62% of errors in the inpatient hospital setting were due to medically unnecessary services or settings, according to the June 2008 CMS RAC demonstration project evaluation report. Experts say one-day stays are part of this statistic because they demonstrate a severity of illness or intensity of service that does not appear to meet criteria for inpatient hospitalization. Inconsistent patient status may be due to oversight on the part of the hospital or physician. It may also occur when the hospital uses condition code 44 to override an inpatient admission and change the patient’s status to observation. Oftentimes, this change is not relayed back to the physician’s office, resulting in incongruent claims, according to Egusquiza. Hospitals must ensure open lines of communication with affiliated physicians, particularly on the weekends when many physicians are simply on call rather than at the hospital. Physicians need to provide the correct admission information the first time around to avoid having hospitals report condition code 44. Correct information also helps prevent RAC recoupments and having to endure the costly and burdensome appeal process, says Egusquiza. Physicians must clearly understand Medicare’s rules for what constitutes inpatient vs. observation status. Don’t confuse physicians by adding other payers’ rules into educational sessions. This added information could frustrate physicians and ultimately undermine the effort, she adds. Technology and software solutions can assist hospitals in determining the high-risk areas on which they should focus educational efforts. For example, OnBase, a RAC administration solution from Hyland Software, allows customers to sort through aggregate data to determine the total number of monthly audits and the volume of each audit type (eg, incorrect codes, incorrect patient status, insufficient documentation for certain Medicare severity DRGs). Hospitals can also use the technology to run specific reports to give to physicians. In addition, OnBase allows users to track both hospital and physician audits when those physicians are employed by the hospital. “In tracking both types of audits in one solution, the organization has the ability to identify whether a patient care encounter is being audited from both an outpatient and inpatient perspective,” says Susan deCathelineau, healthcare manager for Hyland Software in Westlake, Ohio. RACPro, a HealthPort tracking and management software, also provides alerts, reminders, and red flags for corrective action. Users can run reports and perform side-by-side comparisons of what was billed vs. what a RAC claims as erroneous. The software also manages extension requests and associated timetables. Brocato says the information gleaned from RACPro can greatly assist with educational efforts that mitigate risk. If a hospital chooses not to use a software solution, random joint audits can be just as effective, says Egusquiza. Invite physicians to participate in the audit process using hospital records as guides. Ask physicians to also bring their own claims for a side-by-side comparison during which participants look for key elements, such as severity of illness and complications/comorbidities, that support an inpatient admission, says Egusquiza. “It gives you an opportunity to educate as you go instead of gathering it all up and then chasing [physicians] later,” she explains. Keep in mind that physicians need to understand why you’re asking them to change a certain behavior, says Walker. “If you can explain to them why something needs to happen … then you’re more likely to see some positive results,” he notes. Walker says physicians oftentimes simply need a primer on how hospitals are paid, including how DRGs are risk adjusted using a base condition and any relevant exacerbating or complicating conditions. Another key point to reiterate to physicians is that when a RAC deems a claim erroneous, it recoups all money for that service, not just a portion of it. RACs also assume fraudulent activity for these errors regardless of whether there was an intent for fraud. Taking the time to explain this information to physicians can go a long way in preparing for RAC audits and ensuring long-term documentation success, he adds.